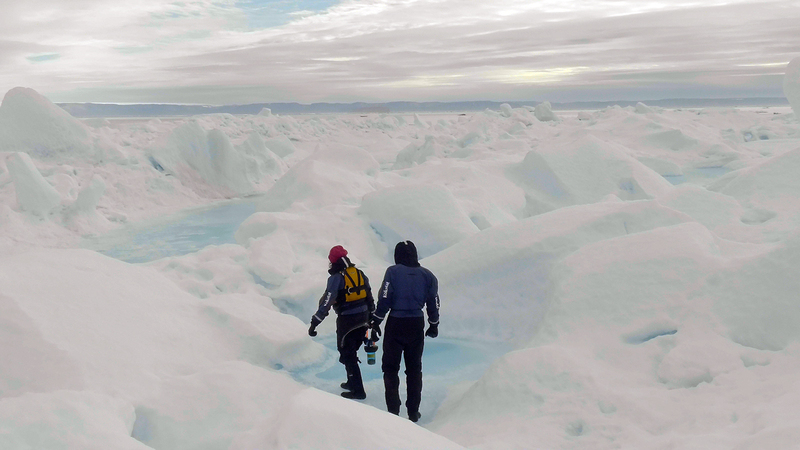 The Royal Canadian Geographical Society's 2017 Expedition of the Year was Enduring Ice, a combination scientific research and documentary film project. 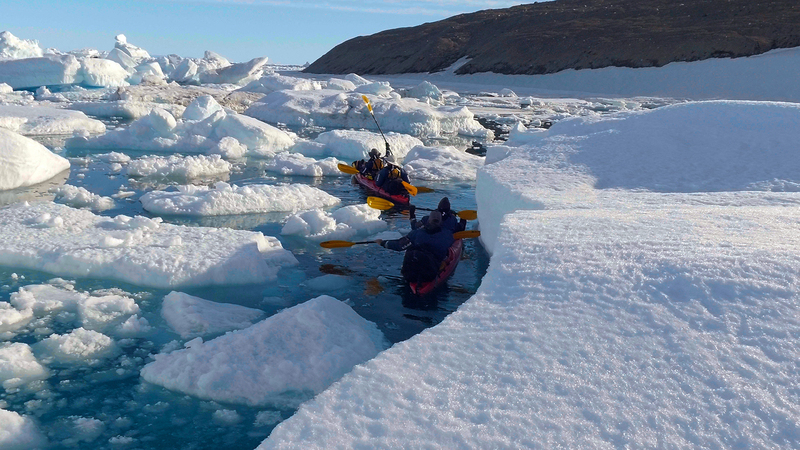 Traversing the Nares Strait between Ellesmere Island and Greenland by kayak, the Enduring Ice team wanted to bear witness to the rapid transformation of the High Arctic due to climate change. Here, expedition member Christopher Horvat, a polar oceanographer and applied mathematician at Harvard University, provides an account of their findings. As a polar oceanographer, every time I give a presentation, I tell the room that sea ice is made up of floes — a kind of ice mosaic. I’ve dedicated six or seven slides to it in every single presentation since I was 21. So now, at 28 years old, I’ve spent a lot of time hammering that concept. 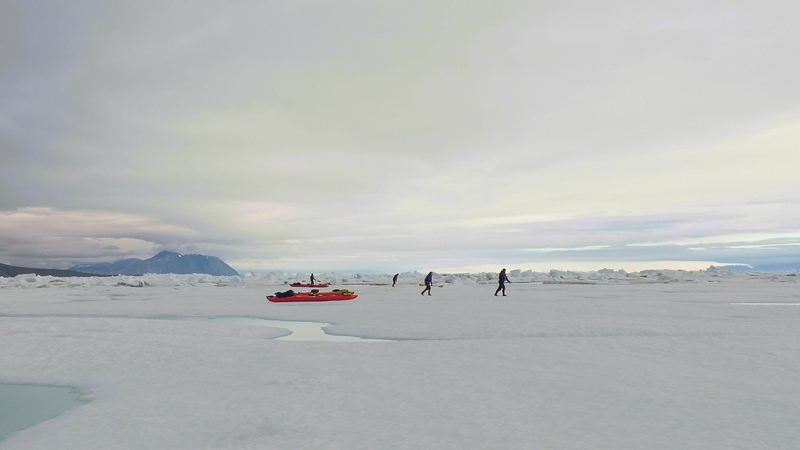 When I got to Nares Strait for our 33-day scientific research and documentary film project last summer, the strait was all soupy — an absolute disaster of a sea ice field. That means you can’t kayak in it. All of a sudden, this concept that I’ve spent all this time explaining to people is right in front of me — and it’s making me miserable. We barely paddled, and instead had to pull our kayaks for 12 hours a day. I actually tore my Achilles tendon on day seven hauling my kayak up a beach before a storm. We spent days at a time stuck in our tents, freezing and getting nowhere. Think of Mars. That’s how I would describe the landscape. It’s above the treeline and barren, just windswept rocks and land, because there’s nothing to break the wind. There are steep cliffs that seemingly come out of nowhere, and huge chunks of ice just flowing past you, blown by the wind. We embarked on this expedition to visualize how sea ice evolves and how these floes look in Nares Strait. We used drone photography for high-resolution videos of sea ice floes to understand what it looks like in that region. There are very few observations of sea ice floes at that scale. From satellite images, it’s hard to see that this stuff is all broken up, but when you’re standing next to it, it couldn’t be more obvious. What we saw and experienced was indicative of the state of the Arctic. We know that sea ice is declining, but we also thought there were still big pieces of multi-year ice, which form ice bridges in the strait and keep the smaller pieces of ice from just flowing out of the Arctic. But when we got to Nares Strait, there was almost nothing like that. 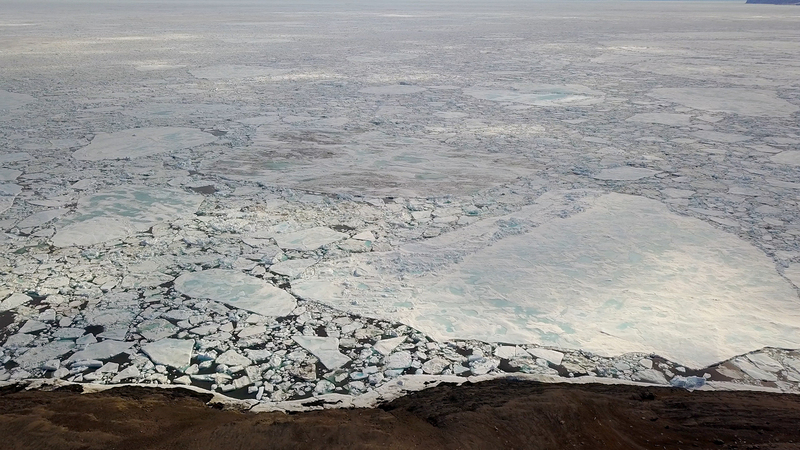 The sea ice in Nares Strait is indicative of the state of the Arctic due to climate change. When they arrived, members of the Enduring Ice team were surprised that the strait contained mainly small pieces of sea ice, rather than the large, multi-year floes they had expected. 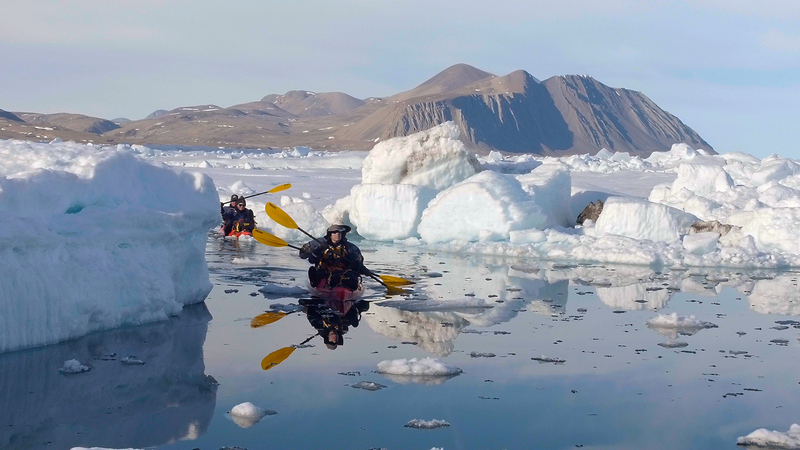 Expedition members Christopher Horvat and Diana Kushner traverse the ice floes in Carl Ritter Bay off Nares Strait, an ice-filled channel between Ellesmere Island, Nunavut, and Greenland. 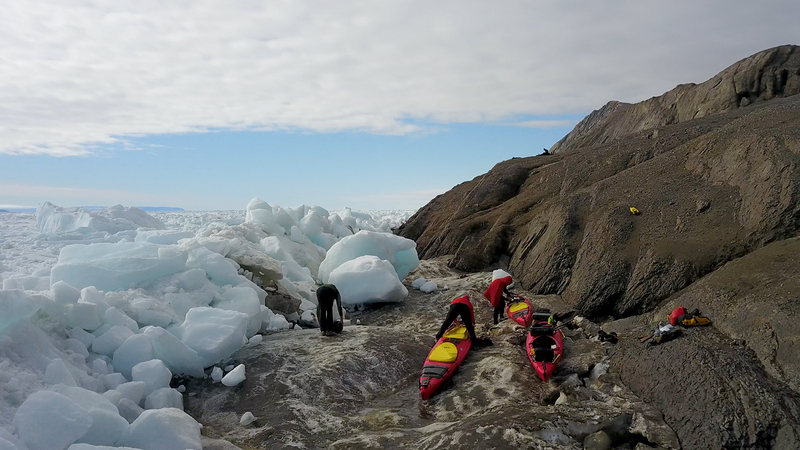 Enduring Ice team members sledge their kayaks across land-fast ice locked into a small bay on Nares Strait. 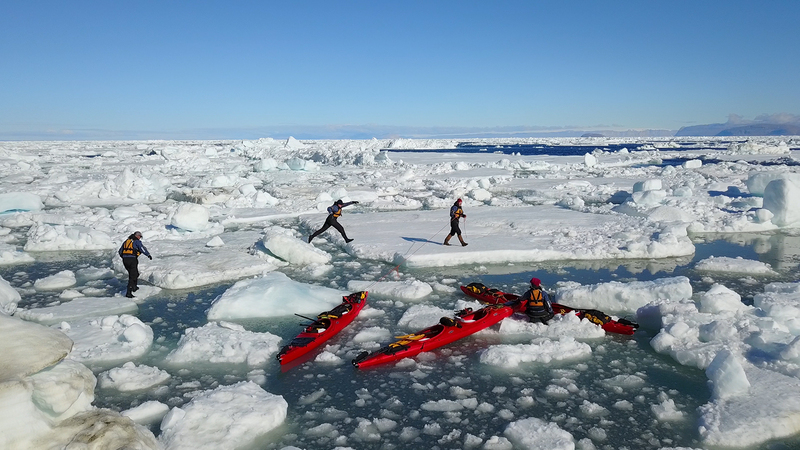 Expedition members enjoy a rare day of kayaking amid the sea ice. 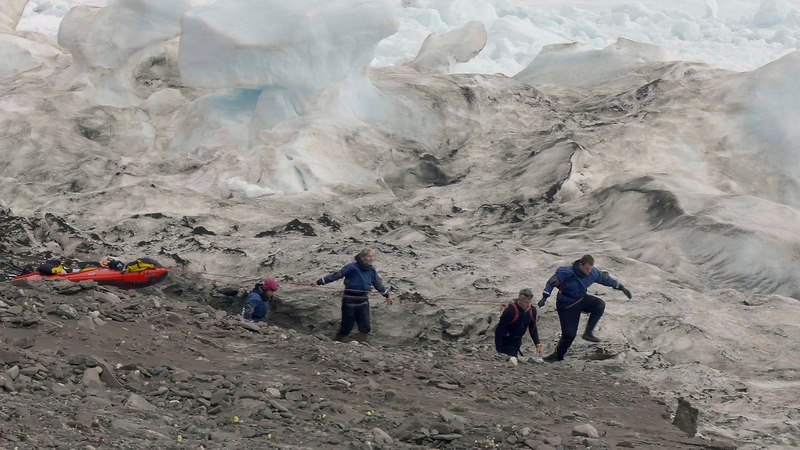 The team navigates through soupy ice floes. Expedition members jump from ice floe to ice floe as they travel through heavy pack ice in the strait. 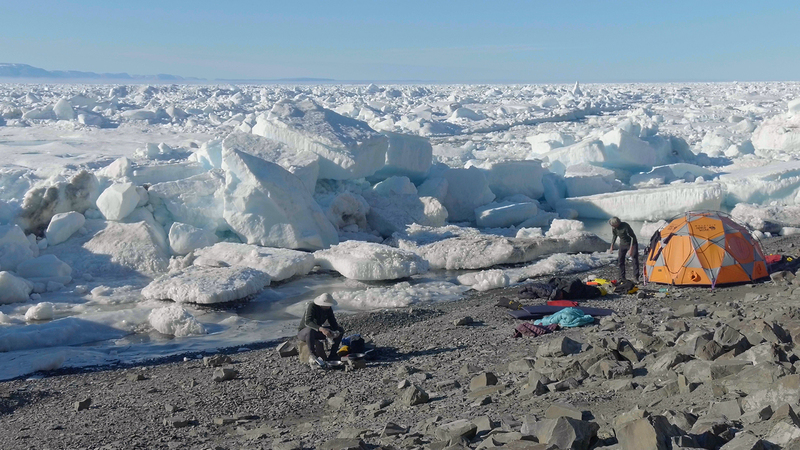 Exhausted after a day of sledging their kayaks through pulverized ice floes, expedition members set up camp on the shore of Ellesmere Island. 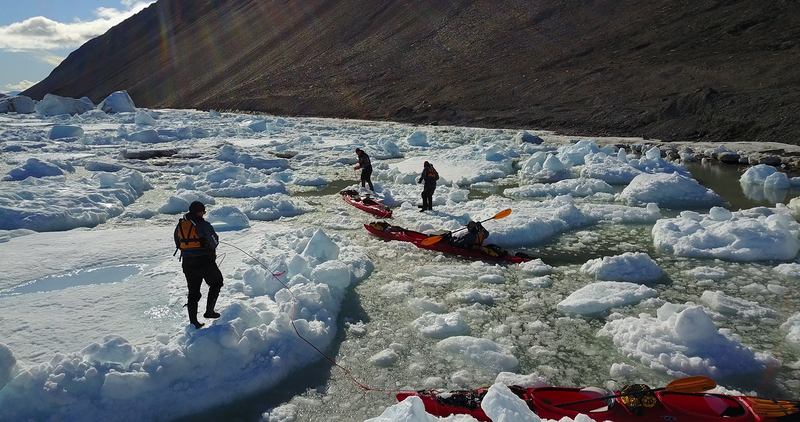 The team hauls their kayaks over rough ice along a rocky shoreline. With Nares Strait clogged with ice, expedition members prepare to climb on shore, dig out a camp site and weather an approaching five-day wind storm. The team navigates a tricky mosaic of ice floes in heavy pack ice on a sunny day in Nares Strait.